My closer-in landing map shows my proximity to the state line, the Iroquois R, and the town of Brook. Note that I am proudly using features of my newly-installed StreetAtlas 2013 Plus software – the labels and measurements (although, the measurement from the town to the river obliterates the name “Brook”). Obviously, I landed in the Iroquois R watershed (3rd hit); on to the Kankakee R (4th hit); to the Illinois R (16th hit); to the MM (779th hit). What a hassle I had landing! Why, you may ask. First, some background: as you know, Dan (but other readers may not), when the Excel spreadsheet (that I created) selects a random lat/long (i.e., my landing location), it does so using a huge rectangle that includes all of the lower 48. Well, such a rectangle also includes big chunks of the Atlantic Ocean (mostly to the south), the northern Gulf of Mexico, northern Mexico (including Baja and the Gulf of California), the Pacific Ocean (mainly off the coast of CA) and south east Canada (east of the Great Lakes). Well, these non-lower 48 landings (I call them “try agains”) happen fairly frequently. By the way, I also include Great Lakes landings as try agains. Twelve try agains in a row! Of course, since I keep track of all things landing, I keep track of try agains. It turns out that during my 1978 landings so far, I’ve had 1402 try agains. 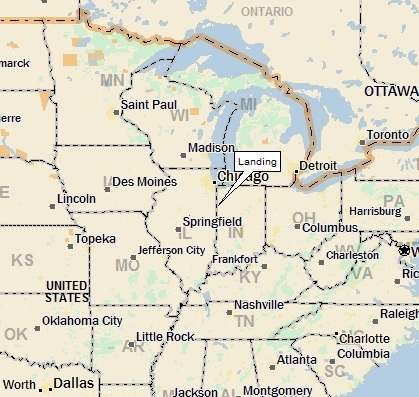 Doing the math: 1402/(1402+1978) = about 41.5% of the time I fire up my Excel spreadsheet, I land outside of the lower 48. The odds of doing this are less than the odds of getting 12 heads in a row when flipping a coin! Doing some more math: the odds of getting 12 heads in a row is one in 2 to the 12th power, or one in 4,096. The odds of getting 12 try agains in a row? Get this . . . one in 2.41 (i.e., 1/0.415) to the 12th power . . . drum roll please . . . or one in 38,550!!!! For people who got bleary-eyed and couldn’t read the last paragraph, let me repeat: the odds of getting 12 try agains in a row is one in 38,550!!! “Now there were two creeks of about the same size two or three miles south of the settlement (that) would help with the selection of the name. I have no desire to excite the minds of people of Brook and have them make pilgrimages to see those two dirty little creeks, but if you look closely at them you can see the origin of the name of the town of Brook.” –Aaron Lyons 1901, from And They Named Her Brook. Wow. The title of the book is And They Named Her Brook. So, it seems that this naming process was pretty important to Aaron, eh? As you can see, it’s no jump-across (or easily ride your horse across) little stream. 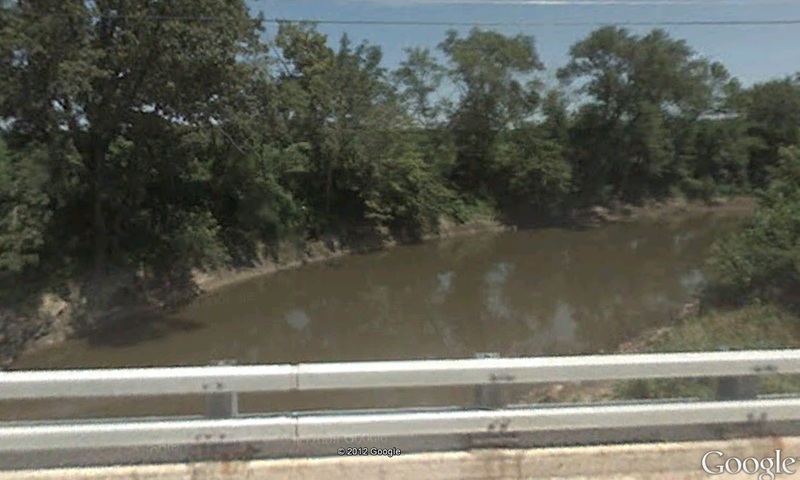 This is a real river!! OK, OK, so there are a couple of little streams south of the river, but give me a break! No one in their right mind would name a town after a couple of insignificant streams (called “ditches” by StreetAtlas) located on the far side of a river!! Wait a second, I need to calm down, take a deep breath before I get too worked up. Maybe I should do a little more research . . .
OK, OK, I think I get it. A careful reading of the history section states that “the first courthouse of the original Benton-Jasper-Newton County was located two miles south of Brook.” This was back in 1839. So, maybe a little settlement grew up around the courthouse, near a couple of brooks, and they named it Brook. The actual town of Brook (in its current location) wasn’t actually formed until 1866; maybe by then, the dreamed-of town by the old courthouse was long gone (or at least inconsequential). So maybe the town fathers figured they’d transfer the informal name of the area around the old courthouse to the new town . . .
(Notice yet another StreetAtlas 2013 feature – I can make the streams stand out as heavy black lines . . .). 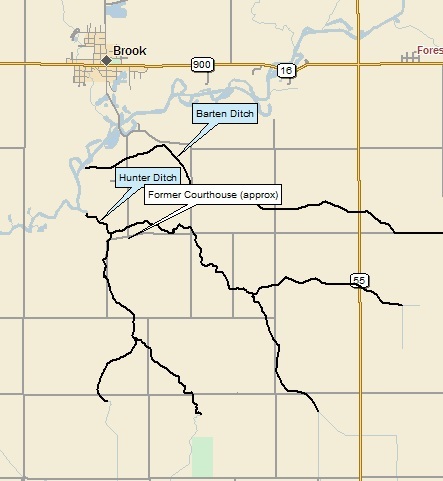 If the courthouse location is correct, the two brooks mentioned by Aaron Lyons are likely the two branches of Hunter Ditch that join together nearby. So anyway, I think that Mr. Lyons’ quote is a little misleading and could use a little explanation. A Landing A Day respectively suggests that the Town of Brook revise their history section, to make it clearer how the town got its name. I may not be the only one who read those words and was more than a little baffled . 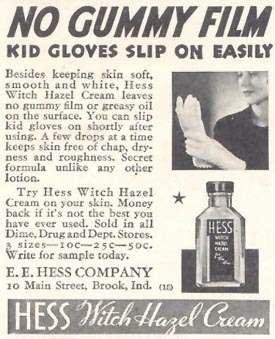 . .
As you can see, Hess Witch Hazel Cream was manufactured right here in good ol’ Brook. The ad is aimed at all of the kid glove wearers with chapped hands who really don’t like that pesky gummy film . . .
Dan – After 4 OSers in a row, the LG smiled upon me, as I landed in an eastern USer . . . IN; 14/20; 4/10; 2; 166.5. For those of you who are paying close attention, today’s landing is the first time my new rule (about 4/10+ vs. 4/10-) made a difference. Don’t know what I’m talking about? Start with “About Landing,” and then check out my February 11th, Cibola, Arizona post. Moving right along . . . I landed in a first-time-ever string of three named ditches. Oh, so I’ve had many named ditches before, but never three of them. Only once before did I have as many as two named ditches . . . So, the three ditches? 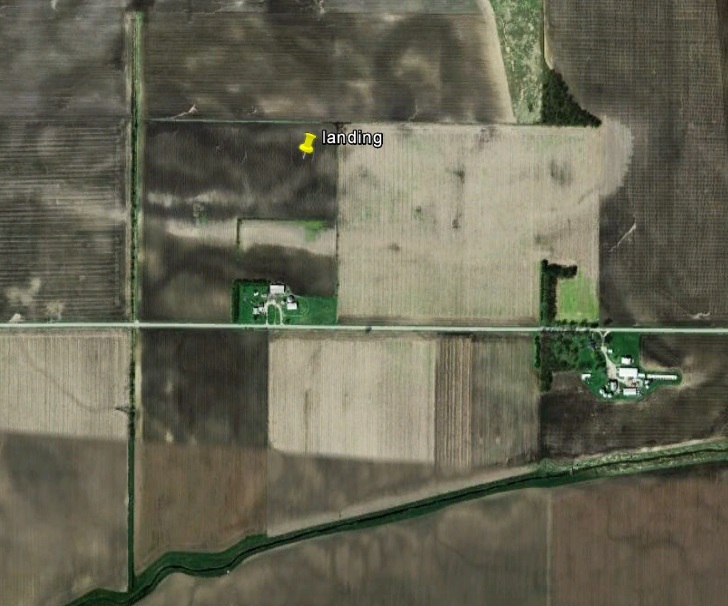 I landed in the Talley Ditch watershed; on to the Morrison Ditch; on to the Montgomery Ditch. Then, for the second time, I landed in the Iroquois R watershed (2nd hit); on to the Kankakee (3rd hit); on to the Illinois (14th hit); on to the MM. The Fraternal Order of Knights of Pythias and its members are dedicated to the cause of universal peace. Pythians are pledged to the promotion of understanding among men of good will as the surest means of attaining Universal Peace. President Abraham Lincoln had applied to be a member but was not able to be initiated because of his assassination. Of much greater interest to me is the fact that there is an ancient meteor crater known as the Kentland crater. Wow. It doesn’t get much cooler for a geologist. Evidently, the area was quarried back in the 1880s, and eventually some geologists were poking around and noticed a bunch of very strange things that one wouldn’t expect in and amongst the flat sedimentary strata of Indiana, like steeply-dipping (tilted) bedrock. Geologists know that the impact occurred no earlier than 97 million years ago, but they’ve been having trouble coming up with a more accurate age, much less a reasonable youngest age (besides sometimes before the relatively recent glacial epoch). How about that!! My landing was in the crater, almost right in the middle!! To show how common (or rare, depending on your perspective) impact craters are, here’s a map showing a bunch of them in the U.S. Kentland is #29. Steve with a shatter cone on a visit to the Kentland impact structure in Indiana. Shatter cones are caused by the shock of a meteorite impact and are usually found near the center of large impact structures. The Kentland crater is no more than 97 million years old. Now heavily eroded and being worked as a quarry, the crater originally measured approximately eight miles in diameter. Steve is the author of the book “Killer Rocks from Outer Space.” Click here to go to his website. Earl Park is a town located in Richland township, Benton County Indiana. Founded in 1872, the community was named for Adams Earl, landowner and developer. Current population approximately 500. Elevation 798 ft. I, for one, am happy to know the town’s elevation. Here’s a circa 1900 picture of the Earl Park jail (aka “calaboose.”) Nasty looking place, eh? It turns out “calaboose” is a Lousiana Cajun version of the Spanish word calabozo, or dungeon. And here’s a street scene with a handsome couple in a handsome hansom. Oh, all right, so it’s not a hansom (a hansom has only two wheels). I just couldn’t resist. Her plane crash in Texas occurred on the same day the Titanic sank. Her brother John was a pilot who was killed in a crash in 1910; Matilde’s parents made her promise to give up flying. She vowed that her flight in Wichita Falls (the one that crashed) would be her last (and it was). She defied a ban on Sunday flying, and was chased across the Long Island countryside by the police, who arrested her. She was released with no charges by a sympathetic judge who declared that flying a plane on Sunday was no worse than driving a car on Sunday.